Were you aware that the quality of your indoor air can actually be worse than that of outdoors? In fact, this is the case in many homes—particularly those that aren’t equipped with the right indoor air quality products or haven’t invested in air quality services in the past. Today’s residences are built with HVAC efficiency in mind—they’re built tight as to not let any conditioned air out or outside air in. This is great news for your heating and cooling costs each year, but not so fabulous for your air quality. Among the numerous products we have available to help combat this, however, is the air purifier. This is a system that helps eliminates contaminants from the air. These pollutants may include allergens like dirt and dust, or even more harmful particles like bacteria and mold—which can make you ill. There are a few different types of air purifiers, too. Each has their own unique purpose and benefits. We’ve highlighted a couple types of air purifiers below. Before we continue though, we also want to state how important it is for homeowners to understand the limitations of their standard air filter. You may assume that the air filter that came with your HVAC installation is there to protect your indoor air quality—however, it’s actually there to protect the HVAC system itself, which is why we want to stress the need for an air purifier! 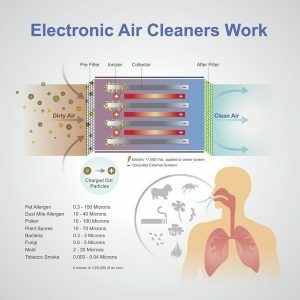 Electronic Air Purifier: Now, onto the different air purifiers on the market today, and their benefits. An electronic air purifier removes microscopic impurities from your indoor air. This can include dust, smoke, smog, pet dander, and even some mold sports. While these particles might seem harmless—after all, you can’t even see them—they can have a pretty significant negative impact on your health and the health of your family. This is particularly true for people who suffer from allergies and asthma anyway. It bears mentioning that for the best results with an electronic air purifier, you must remember to clean their plates on a routine basis. The effectiveness of this device will wear down as dirt accumulates, but fortunately, a quick wipe-down is all you need to resolve it. UV Lights: UV germicidal lights are another type of air purifier that can make your home’s air healthier. UV lights are installed right into your ductwork, to eliminate biological contaminants such as mold and mildew. As you might imagine, the inside of your ductwork is cool and damp, and therefore a great breeding ground for mold—which can make even the healthiest person ill.
UV lights are harmless to people and pets, but deadly to those microorganisms. An added benefit is that by eliminating this mold growth from your ductwork, you can help your air conditioner to perform better—that is, more efficiently. This saves you money in the long run, and that’s never a bad thing, right? Call the friendly staff at Boehmer Heating & Cooling for exceptional customer service, throughout Pittsburgh and beyond!